We help you to automatically remove scammers from your dating site, saving your business time and money whilst improving your brand's reputation. Machine learning allows us to accurately detect scammers and can differentiate between custom scammer signals and scammer trends that are emerging globally. Our API responds with a score in realtime which allows your fraud system to automatically remove fraudulent users immediately, even when moderators are away. 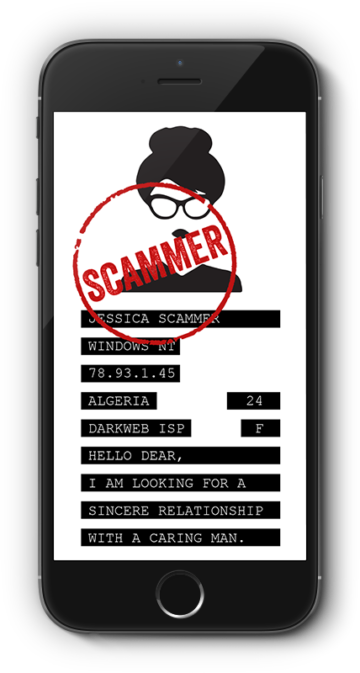 Tap into the dating industry’s largest shared scammer blacklist of profile and network data. We look for patterns in freeform text and messages that detects “scammer grammar” vs normal local use of grammar. Our image detection can instantly check images against millions of blacklisted images worldwide to make sure they are instantly eliminated from going live on your site and putting real daters off. "We have been using Scamalytics for over a year now, and the results have been very impressive. The system integrated pretty easily with our own set up and we're very happy with the results. To give you an idea of effectiveness, last month Scamalytics eradicated 97% of scammers with a 0.6% false positive rate, saving us time and protecting our brands." "Scamalytics is an essential real-time smart assistant for Lovestruck. It empowers our moderation team, reduces their workload and helps ensure the highest levels of quality and curation that our members demand." If you work for a dating site and would like to discuss how Scamalytics can protect your users, your reputation, and your revenues, please contact us using this form. Scamalytics maintain the largest shared anti-fraud database dedicated to the online dating industry. We use cutting edge machine learning techniques to allow moderation of scammers in realtime.